Matching up with the requirements of our clients, we are involved in offering Prestige Clip On Pressure Cooker. Presenting a cookware range which can multi task. Its high quality stainless steel body comes with an induction and gas compatible bas. Clip On, India's First Multi Utility Pressure Cooker from Prestige! 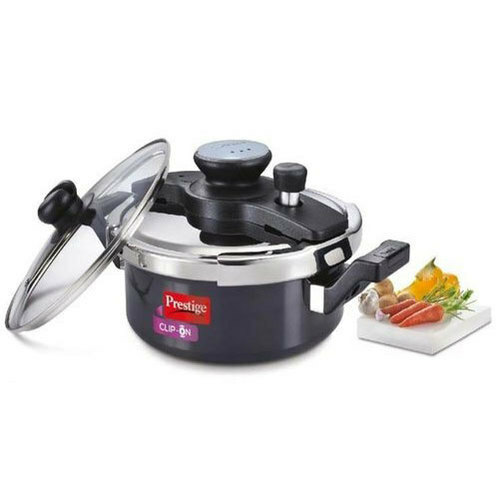 Clip On, India's First Multi Utility Pressure Cooker from Prestige! With the new range of all-in-one Clip-On, you can now saute', steam, fry, boil and pressure cook.The Clip-on range is Modular in design, meaning you can use the same unique lid on all the utensils in this range. The lid can be placed in any position and be closed safely by rotating. What's more is that it comes with an extra Glass Lid which can be used for serving as well. Available in cooker and cookware shapes, it is one of the finest Offering in Kitchen to Table range cookware. Always buy genuine Prestige Pressure Cooker Spare Parts. It is recommended that you buy spare parts at Prestige Authorized Service Centre nearest to you. Before making the purchase please check whether the shop is a Prestige Authorized Service Centre. All such service centres are provided with a CERTIFICATE stating that the concerned shop is the Prestige Authorized Service Centre. Collect the cash memo and retain it with you. The warranty covers any defect due to faulty material or workmanship. Please read user's manual for detailed understanding on warranty, service centres and instructions before use. Since the day UKJ Sales Trading Corporation had stepped into this industry, it endlessly strives on becoming a future organization by providing the products as per developing market needs. It is a Sole Proprietorship (Individual) owned entity commenced in the year 2010 with a single objective to reach the zenith of success. The array of products we wholesale trade comprises of Kadai Pressure Cooker, Clip On Pressure Cooker, Prestige Clip On Mini HA Pressure Cooker, Clip On Handi, Pressure Cooker Handi and many more. Shipment of the ordered consignments in given time frame has always one of the major concerns of our firm and that’s why we have set up a logistic department to handle all the shipment related concerns. By this means, we are able to deliver the precise needs of customer on time.